If you require assistance with the membership process, please call 800-666-3863 and ask for membership. Need to update your membership? Visit your AFP Member profile to make any changes. 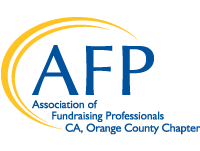 Professional Full membership in the Association shall be open to individuals (a) who, among other responsibilities, hold some degree of accountability for income-generation within the fundraising process; (b) who must hold some degree of responsibility directly for fundraising; (c) who are compensated for their services; and (d) who subscribe to the AFP Code of Ethical Principles and Standards and promote the Donor Bill of Rights. Active members in good standing may vote, serve on chapter or Association committees and task forces and hold Association or chapter office. $250.00 plus chapter dues. Young Professional Open to persons who hold some degree of responsibility directly for fundraising, work within the U.S. and Canada and are compensated for their services, and are 30 years old or younger, must subscribe to the AFP Code of Ethical Principles and Standards and its bylaws and promote the Donor Bill of Rights and be employed, or have been employed by an organization that provides benefits to society. $75 includes chapter dues. Associate Associate membership in the Association shall be open to individuals or volunteers (a) who are engaged in fields related to fundraising and fundraising support, or (b) who have mutual interests with fundraising professionals, and (c) who subscribe to the AFP Code of Ethical Principles and Standards and promote the Donor Bill of Rights. Associate members in good standing may vote, serve on chapter or Association committees and task forces and hold Association or chapter office. $250.00 plus chapter dues. Click here to download an individual membership application. Large Nonprofit Organizational Membership Shall be open to nonprofit organizations who wish to have multiple members in the association. The organization will designate a minimum of eight (8) to receive Professional member benefits. The memberships may be transferred to another individual if the original member leaves the organization. Must subscribe to the AFP Code of Ethical Principles and Standards and promote the Donor Bill of Rights. Nonprofit Organizational members in good standing may vote, serve on chapter or Association committees and task forces and hold Association or chapter office. Starting at $2,000.00 for eight members. 4.Not affiliated with a larger institution supporting their operations. The organization will designate one fundraising professional to receive the benefits offered in this membership category. The membership may be transferred to another individual if the original member leaves the organization. Must subscribe to the AFP Code of Ethical Principles and Standards and promote the Donor Bill of Rights. Limit one membership per organization. Nonprofit Organizational members in good standing may vote, serve on chapter or Association committees and task forces and hold Association or chapter office. $150.00 includes chapter dues.